So here's what I did. First, I collected all senate races in the last 20 years where there were at least 5 late (September or later) polls. 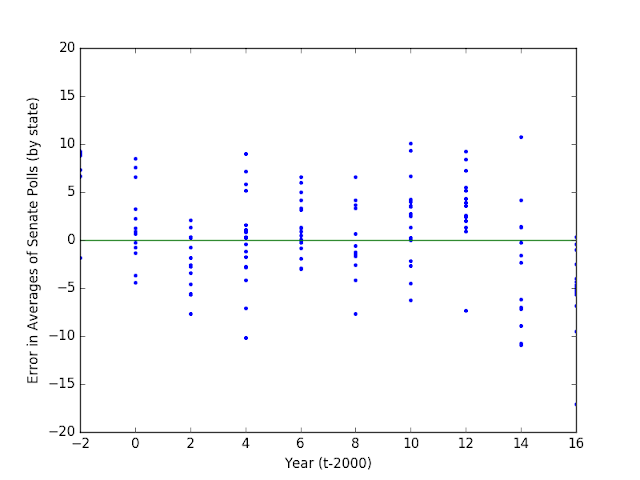 I then averaged every race weighted by number of respondents and compared to the final outcome, a total of 142 races. The result is the figure at top. As you can see, there is a fair amonut of scatter, and no clear trendline. Very much like a bell shape curve. That is, most senate races were within a few points of the final results. Some were not. The average race was only 0.2% from the final result, which means that on average, we can't say that either the Dems or the Republicans typically out-perform the polls. The overall distribution seemed unbiased. 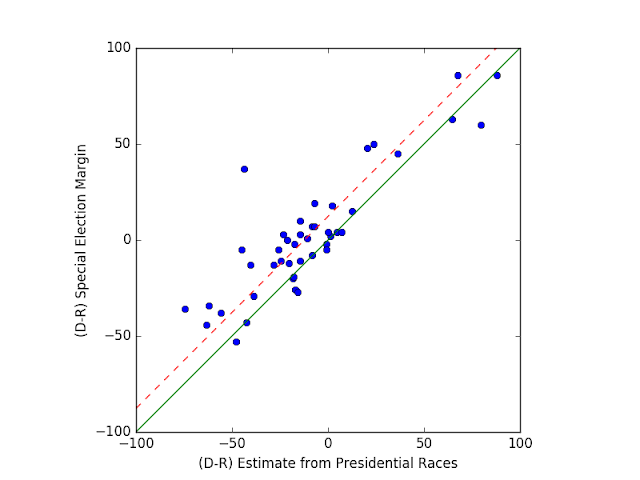 That is, the mean residual was only 0.2% (Dems technically did slightly higher than expected, but only barely). The standard deviation is almost exactly 5%. Another interpretation is that, historically, if candidate A is leading in the polls by 5%, then they have about an 84% change (Gaussian distribution) of ultimately winning. It also means that >10 point leads are pretty safe. NV, TN, MO, ND, FL, TX, 3 apiece currently held by Dem and GOP. The only one outside that range that's an expected flip is AZ. You can play around with these numbers at my senate tracker. 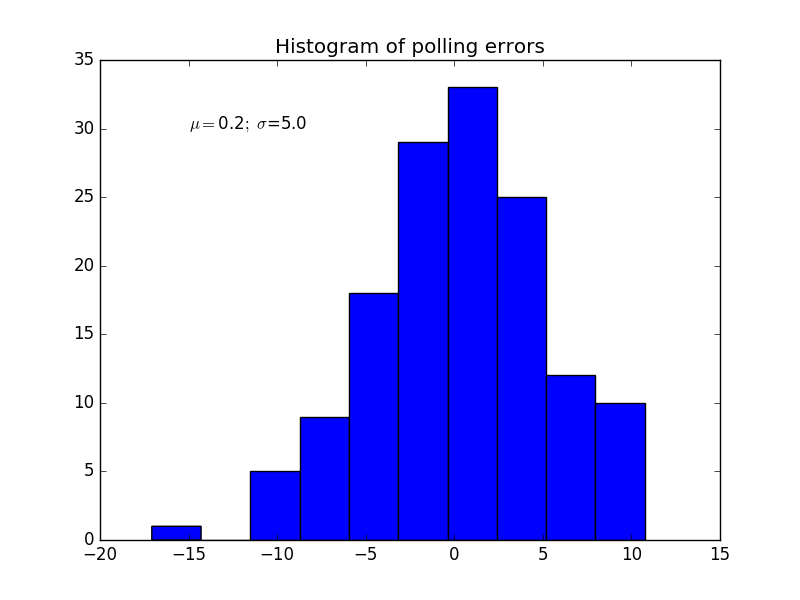 From year to year, there is some overall error which is inconsistent with just polling error. Last year, in the 16 races which met the criteria, Republicans did 5 points better than expected _on average_. In 1998, Dems did 6.5 points better. Those were the most extreme. Bear in mind that this is a combination of random polling error, the unknown systematics which change from year to year, and last minute changes in the opinions of the electorate. Last year, for instance, there's evidence that nationally, the polls moved by about 2 points in the final 11 days. For some reason. That's not all of the polling miss, but it's a fair part of it. In a typical year (again, looking at the standard deviation), the global swing (the amount by which the average of the average misses) is about 3%. The upshot is that by and large these polls actually do a pretty good job predicting the state of the race, but as always, you need to keep an eye on the errors.